The Dark World actress confirms Thor 3, while leaving a trail of bread crumbs leading to even bigger news. Thor: The Dark World may not even be in theaters yet, but it looks like Marvel already has the sequel on their minds. 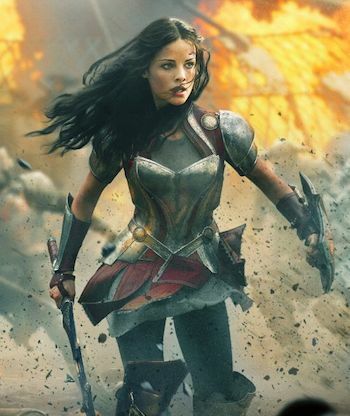 Actress Jamie Alexander, who plays Sif in The Dark World, says that Marvel is planning to make Thor 3. Speaking at a Comicaze 2013 panel this weekend, Alexander said that there will be another Thor movie, assuming The Dark World doesn't crash and burn at the box office. Knowing the film has already made more than $100 million during its international opening this weekend, that's about as close to official confirmation as you can get at this point. Even if the movie hadn't done so well, Marvel Studios' apparently has almost a decade's worth of films lined up, so the decision to make more Thor movies may have been made a long time ago. At the same time, Alexander may score a much larger role in the DC movie universe, dropping hints that she may be in talks to play Wonder Woman in the upcoming Batman vs. Superman film. Rumors that Wonder Women would make an appearance in the film began in September when a casting call revealed the film was on the lookout for a strong woman between 25 and 33. Flash forward to Comicaze, where Alexander said she was in talks with Warner Bros. and DC. While some of links of the chain are more reliable than others, this could be pretty convincing if you're willing to take the leap. For now, Thor: The Dark World opens in the US Friday, November 8.